Harry will pass through 20 countries and cross two continents, it’s 12,000 miles and will roughly take him about a year. 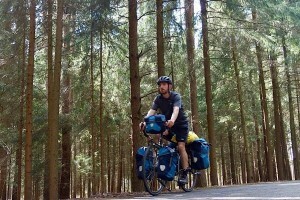 His cycle ride is self-funded and his preparation has been a few longish cycles with his friend, Eddy Stuart. Harry’s the first to admit he’s no endurance athlete and he’s pretty naïve about what’s ahead. 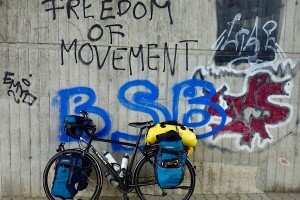 He has taken two years to plan his trip and has made a list of possible problems he may face. The aim of his tour is to explore other parts of world and learn about other cultures and meet interesting people along the way. One of the major reason for his tour is to raise awareness of the charity CALM (Campaign against Living Miserably) and hopefully £10,000 for the charity. Harry says “Life can deal people a terrible hand and if I can positively affect another person while fulfilling my own dreams, it seems like a no brainer. There’s so much stigma around men’s mental health and a lack of willingness from men to ask for help: a common thought is that to have a mental health issue labels you as weak or incapable. Photo courtesy of A Wisemans Tour. Harry has had first hand experience of mental health issues after struggling to come to terms with his brother Tom’s death seven years ago. “ I ended up in and out of hospital from mental breakdowns triggered by substance misuse. So after yet another trip to the hospital I was at a crossroads in my life. I could carry on smothering my emotions with substances or face up to them by getting sober and finding help. Through my own will power and the support of my extremely patient mum and girlfriend, I’ve been sober for almost two years. Vienna Bike Shop team with Harry Photo by Wiseman Tours. 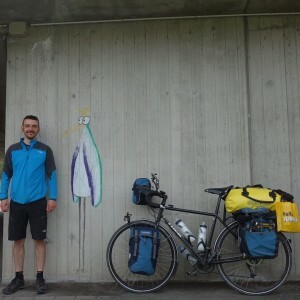 Harry has already started his epic journey – he’s reached Vienna and has met plenty of wonderful people who have let him stay in their homes and fed him. 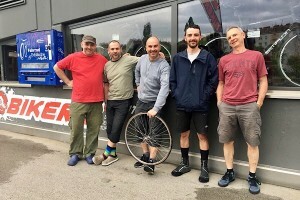 He popped into a bike repair shop in Vienna and they have helped with his bike repairs free of charge as a donation to the tour, but while Harry is stopping there he’s somehow agreed to take part in a bike race. His website and Facebook pages have got me hooked, I’m thoroughly enjoying looking at his map to find out where he’s travelled to and reading his updates has so been so uplifting. I’m hoping the people of Hastings get behind Harry and support him all the way. He truly is an inspiration. If you fancy following or making a donation you can find Harry on his website Wisemanstour or look him up on Facebook or Instagram ‘A Wisemans tour’.